You can also download Article 8 of the rules and regulations as a pdf. This is provided to customers in our Service Area as an informative guide of policies and procedures relating to water service. These Rules & Regulations are subject to periodic revisions. The District will use its best efforts to supply water dependably and safely in adequate quantities and pressures to meet the reasonable needs and requirements of account holders. The District will endeavor to provide water that is wholesome, potable, in no way harmful or dangerous to health and, insofar as practicable, free from objectionable odors, taste, color and turbidity. The application is merely a written request for service and does not bind the applicant to take service for a period of time longer than that upon which the minimum charge is based; neither does it bind the District to serve, except under reasonable conditions and upon the approval of the Manager. Each applicant for service is required to sign, on a form prescribed by the District, an application providing sufficient information as the District may reasonably require for the above stated purpose and to enable the District to determine the credit worthiness of the applicant. Applications for service to any property will be granted only if all assessments, fees, charges, delinquent water bills, and penalties due to or against said property have been fully paid. An application for water service requires an application to be submitted by the property owner. The District holds the property owner ultimately responsible for payment. Proof of ownership, if required, must be submitted at the time of application and would include, but not be limited to, a copy of the deed to the premises, a title insurance policy, a current property tax bill or the escrow closing statement. In addition, the District requires proper identification of all applicants (any government issued identification). Any applicant applying on behalf of a business or property owner are required to submit legal documents to support their link to the property and/or business applying for water. These documents may include: articles of incorporation, real estate assignment letter, real estate agreement, property management agreement, etc. 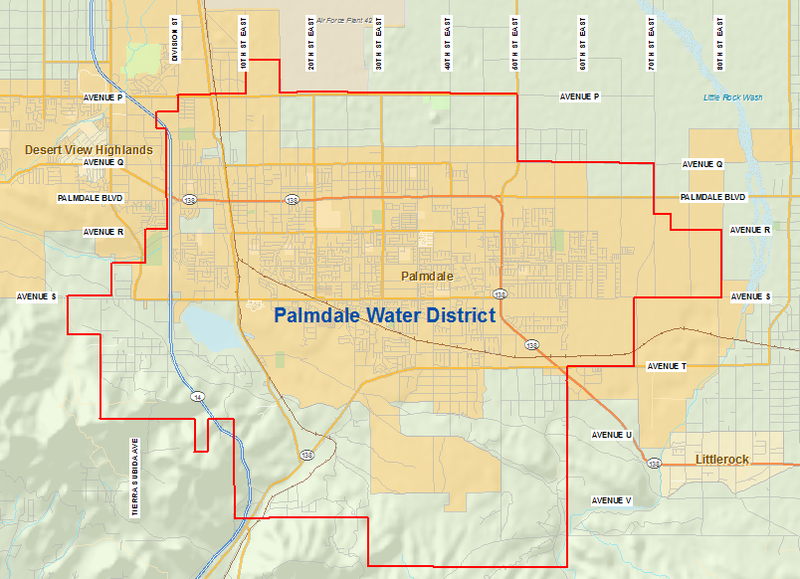 Palmdale Water District shall not be responsible for damage to persons or property caused by failure or defects of pipes, high or low pressure, by escape or leakage due to conditions on said premises existing at or after turning the service on, and applicant will hold Palmdale Water District harmless therefrom. Commercial or Industrial: For each single or multiple commercial or industrial unit served by the same service meter – $300 per unit. Residential: For each dwelling unit served by the same service meter — $200 per unit. Additional deposit: At the Manager’s discretion, the District may require an additional deposit as a condition precedent to water service or reconnection if (i) District determines the account holder has an unsatisfactory payment history, (ii) the account holder is not credit-worthy or has previously had water service disconnected for non-payment or rejected payments or (iii) the nature of the services or the account holder’s intended use of water warrants an additional deposit. In such instances, the total deposit shall be determined by the Manager. 1) Such deposits will be refunded to account holders at the termination of water service, provided all water charges have been paid. However, no refund will be made where the balance remaining in the deposit account is less than $5.00. All amounts less than $5.00 will be transferred to the water conservation account to be used for the education of the public regarding water conservation. 2) Single Family Residences Only: One year after the date a deposit is made the Manager has discretionary authority to refund such deposits upon submission of a PWD Deposit Refund Request Form, and if the account holder meets the following criteria: (a) has at least one year of established active customer history, (b) does not have more than one 48-hour Disconnection Notice (door-tag) on the account within the one year period immediately prior to request, (c) does not have any disconnect charges on the account, and (d) has not had any rejected payments. b) Under the Negative column, the Public column, and the Collection column it must show zero. c) Under the Payment History column, it should show 1’s and X’s only. Any other number appearing would be considered as unworthy credit. Existing account holders who meet the requirements for a refund of deposit may transfer from one account to another without having to make a deposit as long as there has not been more than a thirty day lapse in service. However, the water service application process still has to be full-filled. All requests for temporary service shall be made on an approved application form available in the District office. Temporary service will be provided for a maximum of five working days to facilitate cleaning and showing of property for sale or rent. This service is not to be used for maintenance requiring high volumes of water. A charge of $85.00 that allows usage of 5 units or less will be collected in advance of service; 6 or more units will be charged at current District rates (This rate is subject to revision by the Board from time to time). For those premises that do not have an existing service connection the applicant will be charged for the installation and material costs for a service connection in addition to the Assessment Parity Charge, the Capital Improvement Fee and the cost of main extension (if needed); in all cases the applicant shall contribute for any existing mains and public fire hydrants. Please contact the District office for additional Rules & Regulations and the rates and fees as established by the Board. The service lateral, meter, and meter box furnished at the account holder’s expense and located wholly or partially upon account holder’s premises are the property of the District. The District shall at all reasonable hours have access to meters, service connections and other property owned by it which may be located on account holder’s premises for purposes of installation, maintenance, operation or removal of the property. If the account holder, new applicant or developer is found to be responsible for any damage done to District property, such damages shall be reimbursed to the District at cost plus administrative overhead. If responsibility for damage is not known, charges will be made to the current account holder or property owner. We hold the property owner ultimate responsible. All requests for construction water shall be made on an approved application form available in the District office and accompanied by the appropriate deposit amounts as stated on that form. Any costs involved in supplying such connections will be prepaid by the applicant. The approval of construction water is subject to the availability of water necessary to meet normal domestic demands as determined by the Manager. Please contact the District for allowable uses of construction water and other rules and regulations pertaining to water for construction needs. Fire hydrants connected to District mains are for use by the District and by organized fire protection agencies. Other parties desiring to use water from fire hydrants for any purpose must obtain written permission from the Manager and from the appropriate fire protection agency prior to use, and shall operate the hydrant according to the instructions issued by the Manager. Unauthorized use will be subject to penalty and will be prosecuted according to law and be subject to the appropriate fine specified in Appendix D in the District’s Rules & Regulations. In addition, when any person, company, or agency is determined to be the responsible party that has caused damage of a fire hydrant or blowoff, the District may charge that party with all costs necessary to repair the damages and the cost of water loss. Retail charges consist of a minimum monthly service charge, commodity rate charge, water quality fee and a possible elevation booster surcharge, if applicable. The monthly service charge depends on the size of an account holder’s meter and is fixed irrespective of the quantity of water consumed. The commodity rate for water consumption is based on a 6-tiered system. Rates range from $.84 per hundred cubic feet (hcf) to $6.87 per hcf additionally a water quality fee of $.11 per hcf is assessed. For service areas 3000 ft and above, an elevation booster surcharge of $0.09 to $1.23 per hcf is assessed. Conservation efforts mean lower usage and lower usage is rewarded with lower rates. For more information contact the District office. In order to recover the cost associated with after hours service calls, late payments, disconnections, reconnections, and other damages sustained by the District, the specified items listed below are charged to account holders and/or property owners. Account Setup Charge: All applicants applying for water service is subject to a $25.00 account setup charge. Turn-On Fee (Trip Fee): If an account holder requests that a service to be turned on after paying all applicable fees and charges and a District representative turns the water service on and water is found to be running, the account holder shall then be required to pay a $15.00 fee for an extra trip to attempt to turn the water on. Late Charges: A late charge of 10% of the balance due for the first 30 days and then 1 1⁄2% for each 30 days thereafter. Shutoff Fee: The District may disconnect an account holder’s service for various reasons including, but not limited to, (a) non- payment of bills, (b) failure to comply with rules and (c) fraudulent use of service. Such involuntary disconnections are subject to a $30 Shut-off Fee and/or other administrative charges. Restoration of Service: The District will endeavor to make reconnections as soon as practicable; however, the District shall make the reconnection before the end of the next regular working day following the account holder’s request and payment of any applicable disconnection fees and/or security deposit(s). Reject Payment Charge: When an account holder’s payment is rejected for any reason the District will consider the account not paid. The account holder’s account will be assessed a $45 rejected payment charge ($25 fee and $20 Door-Tag fee). A 48- Hour Disconnection Notice will be issued to obtain full restitution for the rejected payment. No checks are allowed to cover for this type of transaction. Water service will be disconnected if the amount of the rejected payment and all applicable fees and/or deposits is not paid within the 48-hour period. Upon shutoff of water service for a rejected payment, a $30.00 Shut-off Fee will be assessed to the account. Non-emergency Service Call Fee: Service calls made on weekdays after regular working hours (8am-5pm), on Saturdays, Sundays, or holidays are subject to an $80 fee. Pulled Meter Charge: If an account holder’s service has been disconnected and then it is found back on illegally, the meter will be removed from the premises and a charge of $60.00 will be assessed. This charge along with any other applicable charges must be paid before the service and meter can be reconnected. Angle Stop Repair Charge: If District finds the angle stop damaged and the work to replace it is done during normal business hours the cost to replace it is $440. If the replacement has to be done after business hours, weekends, and holidays the cost to replace the angle stop is $600. Rendering of Bills: Bills for service will be rendered on a monthly basis and are due and payable upon presentation. Bills become delinquent 25 days from date of the invoice. It is the account holder’s responsibility to assure that payments are received at the District’s office in a timely manner. If payment for a billing period is not made on or before the 25th day after Date of Bill, a late charge of 10% of the balance due will be assessed. For account holders information, each monthly bill reflects the past due which includes the 10% late fee as well as the new due date which it is 15 days from original bill due date. In person: We accept Cash, Checks/Money Orders, Credit Cards (Visa, Master, and Discover). In Night Drop Box: Place check or money order along with bill payment-stub in our N/D Box located in front of our office (2029 E. Avenue Q, Palmdale, CA 93550). ). Payments made through the Night Drop Box will be post to your account the next business day. *** (Electronic and automated phone payments may take up to 48 hours to reflect on your account). Upon written confirmation of the doctor’s certification of life- threatening conditions, determination by the District of the account holder’s inability to pay and District approval of the account holder’s written request for a 12-month amortization payment plan, a written amortization plan will be entered into between the District and the account holder. The account holder will be charged an administrative fee and the plan shall include a charge for interest of 10% per annum or the maximum legal rate, whichever is lower, on the unpaid balance. The account holder must comply with the plan and remain current as charges accrue in each subsequent billing period. The account holder may not request further amortization of any subsequent unpaid charges while paying delinquent charges pursuant to an amortization plan. Failure to comply with the terms of the plan will result in delivery of a 48-hour Disconnect Notice. Disputed Bills: The account holder has a right to initiate a complaint or request an investigation regarding the accuracy of water charges on any bill tendered by the District. Water service may not be terminated until the investigation is completed and the account holder has been notified of the District’s decision. Up to 5 calendar days prior to the Delinquent Date on the bill the account holder can make such a complaint in writing and deliver it to the District at its office along with all evidence and data the account holder wishes to be considered by the District. The Manager shall review the complaint and render a decision as to the accuracy of the water charges. If water charges are determined to be incorrect, a corrected invoice will be provided and the revised charges will be due within 10 calendar days after the date of invoice for revised charges. If the water charges are determined to be correct, the water charges are due and payable at the time the decision of the Manager is rendered. If the decision of the Manager is not to the satisfaction of the account holder, the account holder may request in writing a hearing before the Board at the next regular meeting. The request must be submitted in writing to the District at least 4 calendar days prior to the next regular meeting of the Board. Each account holder of the District is urged to install devices to reduce the quantity of water to flush toilets and to reduce the flow rate of showers. Each account holder is further urged to adopt such other water usage and reusage practices and procedures as are feasible and reasonable. For tips and hints on how to avoid over-irrigation, detect leaks, economize water and reuse water or for landscaping ideas utilizing water tolerant plants and hardscape themes contact our Water Conservation Coordinator at (661) 947-4111, x1020 during regular business hours. California law prohibits the waste and unreasonable use of water and requires that the District take all appropriate actions to prevent waste and unreasonable use of this limited resource. There are five Directors elected at large from the District, each to be a resident of one of the five voting divisions. Regular meetings of the Board shall be held on the second and fourth Wednesdays of each calendar month at 7 p.m. at the offices of the District.